As we behold this creation through the eyes of Christ, we behold glory all around us. The world around us is pregnant with the fire of God. Wind blows through fields of sun soaked grass. Streams splash and ripple down the mountains. Life is throbbing above and below the land. Even the dirt sings out the glory of God. One moment Jesus tells His disciples to follow Him down to the cross, and the next moment He leads them up a mountain. One moment Jesus says that he must go down to the darkness of death and the next moment He is lifted up high and shining brighter than the noon day sun. One moment He speaks of humiliation and crucifixion and the next moment he exalted and transfigured in glory. And these moments are bound together. Just after Peter confesses Jesus as the Christ, the Son of the Living God, who will usher in the Kingdom of God, Jesus announces that he will suffer and die at the hands of the elders, chief priests, and scribes. Unthinkable. Peter resists. Jesus rebukes. And then he turns to all the disciples, “If anyone would come after me, let him deny himself and take up his cross and follow me” (Matthew 16:24). To follow Jesus is to follow in the way of suffering and death. How can this be the way of the kingdom, the way of peace and love, the way of establishing God’s rule upon the earth? Before we can get our bearings, the story shifts. Jesus is leading Peter, James and John up a high mountain. Moses went up a mountain to meet with God. And the clouds came down and the glory shone out like consuming fire. “All the people witnessed the thunderings, the lightning flashes, the sound of the trumpet, and the mountain smoking; and when the people saw it, they trembled and stood afar off” (Ex 20:18). Elijah went up a mountain to meet with God. And the wind blew, and the earth quaked, and the fire burned. Then God spoke in the shuddering silence. Jesus took Peter, James, and John up a high mountain to meet with the Father. And the consuming fire of God burned out from Jesus in a light brighter than the noonday sun. Even his clothes lit up in a white brighter than all white. The Glory descended upon Moses. The Glory descended upon Elijah. The Glory shone out from Jesus. The very fire of God burned in the humanity of Jesus. For a moment, the veil was removed and the disciples beheld the Holy Fire of God in Man. For a moment, they caught of glimpse of the glory of God burning out in the midst of creation. The opaque world became translucent with the very fire of God. Paul would write that when we turn to the Lord, the veil is taken away. And we with unveiled face behold this glory streaming down from the mountain, from the person of Jesus Christ. And in beholding, we are changed, transformed into the same image from glory to glory. We are following in the steps of Peter, James, and John up the high mountain and into the glory of God. Paul himself beheld the fiery glory of God on his way to Damascus and he was forever blind to the glories of the world. From then on, “All things were counted loss for the surpassing glory of gaining Christ” (Philippians 3:7). He said that in Christ, “we shine out as lights in the middle of a perverse generation” (Philippians 2:14-15). And all creation watches and waits the children of God to shine out in glory of Christ Jesus (Romans 8:19). As Irenaeus writes, “The glory of God is the living man.” Then he continues, “and the life of man consists in beholding God.” As we behold our living Lord, we are changed, we are awakened, made fully alive. And His gracious light shines out from us to transform all creation. For all creation is destined to shine out in this glory of God in Christ, which is brighter than the noonday sun (Romans 8:18-23). Abraham Kuyper writes, “(T)he work of the Holy Spirit consists in leading all creation to its destiny, the final purpose of which is the glory of God.” In the Transfiguration of Jesus, we behold the glory of God, we behold our own calling to shine out, and we behold the hope of all creation shining out in perfect glory. As we behold this creation through the eyes of Christ, we behold glory all around us. The world around us is pregnant with the fire of God. Wind blows through fields of sun soaked grass. Streams splash and ripple down the mountains. Life is throbbing above and below the land. Even the dirt sings out the glory of God. Mary Oliver reminds of this glory as she beholds a swan. From this place of light, of love, of sweet communion, we behold the beauty of the Lord in all things, and our only response can be praise, joy, laughter, song, delight. Even as I long for the glory and the beauty and the light of Christ to shine in and through me and all things, I am aware of my own weakness, my own tendency toward pettiness. I am aware of the times when reading the Scripture seems like staring into a blank wall. Some days seem full of glory, but many days do not. And the idea that I am walking, moving, growing from glory to glory seems like a wonderful dream but so far from the reality of walking in this world of grime and pain and struggle and sadness. I don’t see the light of Christ shining out from all things. The world often seems so dark, so broken, so fallen. I say the world and yet, I acknowledge I am dark and broken and fallen. 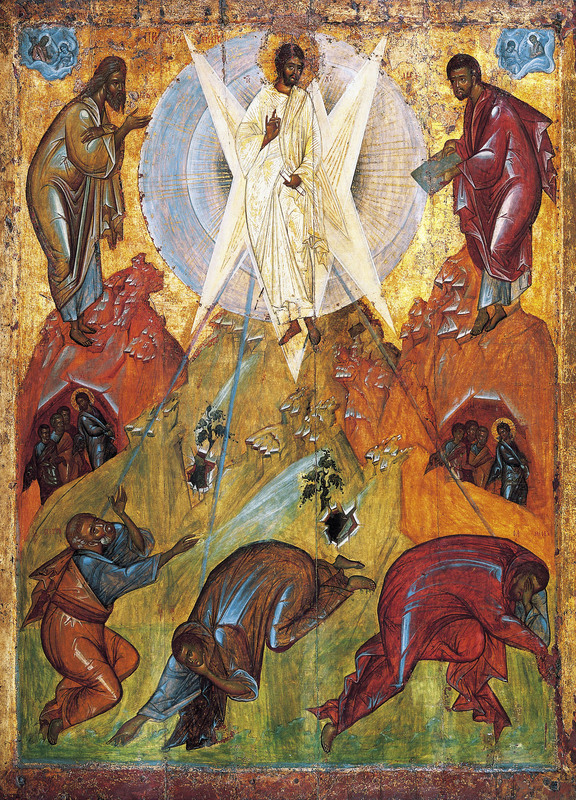 Peter beholds the transfigured Christ and comes down from the mountain only the deny that very same glorious Savior. All too often I identify more with the stumbling and doubting and denying Peter and less with Peter as the Rock, the true one, the foundation. I am reminded that the glory of the ever-shining Lord is bound up with the word of the cross. Even as Peter recognizes that Jesus is the Christ, Jesus says that he will suffer and die. And that his disciples must also follow him in this way of the cross. Jesus does go up the high mountain. Jesus does shine out brighter than the noonday sun. Then he comes down the mountain. And he keeps going down. Down among the possessed and sinful. Down into the hands of the people. Down, down, down into the curses and taunts and beating and mocking and all humankind. Stripped of all form and majesty. Humiliated before a wicked assembly of scribes and priests and me and you. Despised. Rejected. Down beneath our contempt. Stricken, smitten, afflicted by God. Pierced for our transgression. Crushed for our iniquity. Falling under our iniquities, our lies, betrayals, denials, deceptions, destructions. Our petty sins. He keeps falling under us. Bearing the weight of the world, the sin of the world, the betrayal of the world. Falling fully into death. Our death. The death of all things. All hope, all life, all love, all truth. Falling into the undoing of all things. Falling, falling, falling into all hopelessness, all failure. Falling into the end of all things. The annihilation of all things. Falling into the formless and the void. In His dying, we have died. And in His rising, we rise. For He is able to is able to keep us from stumbling and to present us blameless before the presence of his glory with exceeding joy (Jude 24). Be encouraged this day. Even as we behold the glorious unveiling of His light in the Transfiguration and we acknowledge the darkness within and around us that seems so encompassing. The light has overcome the darkness. As we follow Him on the down the mountain and look toward the valley of the shadow of death and the way of the cross, we rest in Him. It is the Lord who goes before us. He will be with you; he will not leave you or forsake you. Do not fear or be dismayed” (Dt 31:8). Irenaeus, Against Heresies, Book 4, 20:7, quoted from “Saint Irenaeus of Lyons” on http://www.taize.fr/en_article6431.html. Abraham Kuyper, “Principle of Life in the Creature” from The Work of the Holy Spirit, translated by Henri De Vries, Funk and Wagnalls, 1900. Evdokimov, Paul (2011-02-22). Art of the Icon, The: A Theology of Beauty (Kindle Locations 212-213). Oakwood Publications. Kindle Edition. Hans Urs Von Balthasar. Heart of the World.